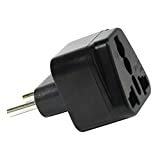 The electrical sockets used in Algeria are type C and type F. These are 2 variants of the same socket - one grounded (with an earth pin) and the other ungrounded. 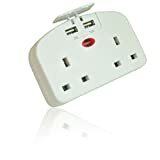 You will therefore need a UK 3 pin to type C/F adaptor in order to plug in your appliances. 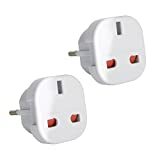 Voltage - The mains voltage in Algeria is 230 V which is compatible with all UK appliances (UK voltage is currently specified as 230 V +10% / - 6%). Frequency - The frequency in Algeria is 50 Hz which is the same as the UK. Special considerations - A Type C variant may be found. It has a ground post offset about ½-inch from center.